This thesis investigates two issues. It studies the interpretations of sentences with plural arguments and it analyzes anaphoricity triggered by the presence of semantically plural nouns. Regarding the first point, it is standardly assumed that sentences with plural arguments can have many interpretations. This thesis discusses various psycholinguistic experiments, as well as two new questionnaire studies, which show in detail how the preferences among these interpretations depend on the type of noun phrase, including preferences that are commonly not acknowledged in the semantic literature. One goal of this thesis is to offer a semantic and pragmatic account which captures all the interpretations but can also explain why some are preferred over others. The explanation is used for studying the anaphoric expressions `same’, `different’, `others’ and reciprocals. What these expressions share is their ability to be anaphoric sentence-internally if there is a semantically plural noun in the clause. However, the availability of this reading depends on the type of noun phrase used, in a similar way that preferences in the interpretations do. Based on these and other data, the thesis offers a novel formal semantic analysis of reciprocals and argues for a particular semantics of `same’, `different’ and `others’. 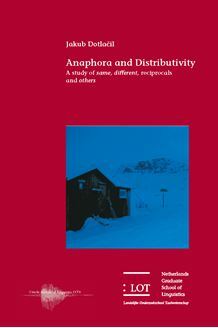 It is shown what consequences the analysis has for our understanding of anaphoricity and plurality. This study is relevant for scholars working on binding, anaphora, and the semantics and pragmatics of pluralities. More generally, it is of interest to scholars in the field of semantics and pragmatics, as well as for linguists working on the syntax-semantics interface.